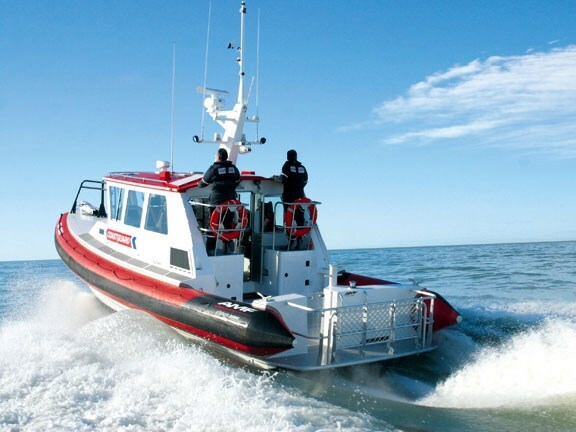 Until now, Hawke’s Bay Coastguard (based in Napier) has operated an 8.5m Naiad RIB, and while it has served the unit well, it’s never been ideal given that the unit’s responsible for one of the largest operational areas in the country. And as Alex Smith – one of the skippers – points out, recreational boaties are going further afield in search of more rewarding fishing grounds. "With improved electronics and the trend to bigger boats, increasing numbers of fishermen are heading to the reef some 75 nautical miles east of Napier – and often even further afield. 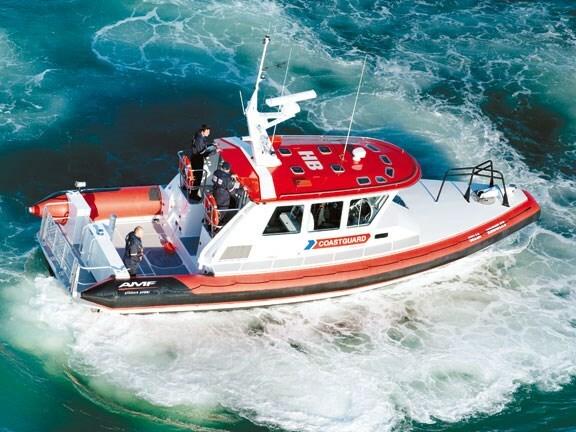 Responding to an emergency out there in rough conditions with the Naiad is a tall order." Smith – who has a mechanical engineering background and has been a Coastguard skipper for many years – had a clear idea of what the ideal boat would look like. 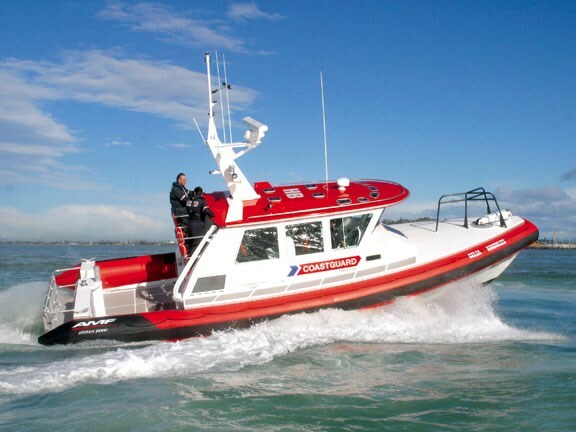 His investigations took him to Tauranga’s AMF boats, and together with designer David de Villiers, they nutted out the specs for the new vessel. The result is unique. 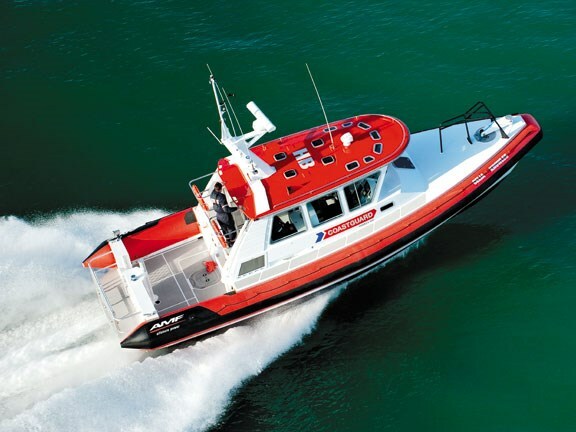 Designed for a crew of four to six, the Celia Knowles is powered by twin 480hp Cummins six-cylinder diesels, and with a fuel capacity of 1100 litres, she has a range of 230 nautical miles at a cruise speed of 30 knots. 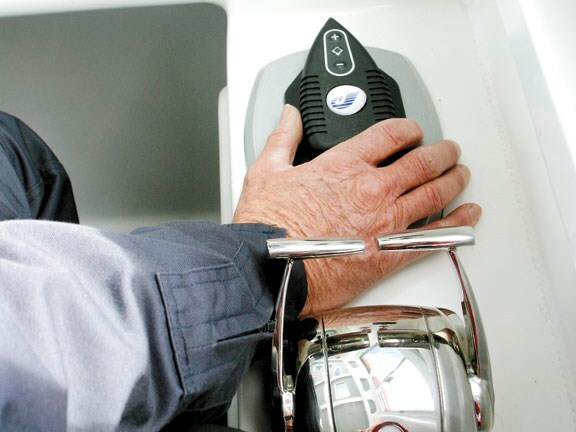 The entire boat is fashioned from 5083 marine grade alloy, with 8mm for the bottom plating. Hull sides are 6mm, with 5mm and 6mm frames and stringers. The heavy-duty tubes are Hypalon. Smith selected the Cummins diesels because "they have a good history in this industry, and parts and service availability in this area is great." They are also exceptionally quiet. "When a crew is at sea for hours at a time in tough conditions and things get tense, the non-stop drone of the engines can be sapping. Even without any insulation in the engine room, we have only 63dB in the cabin, with doors wide open. Low noise is a huge bonus for rescue crews." Fuel efficiency is also pretty good. Fully loaded with fuel and crew, the boat weighs nearly nine tonnes, and at peak revs the engines drive her to 40 knots. At a more sedate cruise speed (30 knots), the engines are turning over at 3200 rpm, each consuming 61 litres per hour. Smith was emphatic that the new boat would have water jets. "One of the biggest problems for a rescue crew is retrieving people from the water. Often it’s dark so visibility is limited, and it’s often in rough seas, so maneuverability is compromised. Spinning props are very dangerous in such situations. Water jets eliminate that issue – we can be far more aggressive about getting close to people in the water." The engines are coupled to large HamiltonJet 322 units, controlled by the company’s Blue ARROW steering control system - an electronic, fly-by-wire system, all controlled by a micro-processors via a wireless mouse at the helm station. 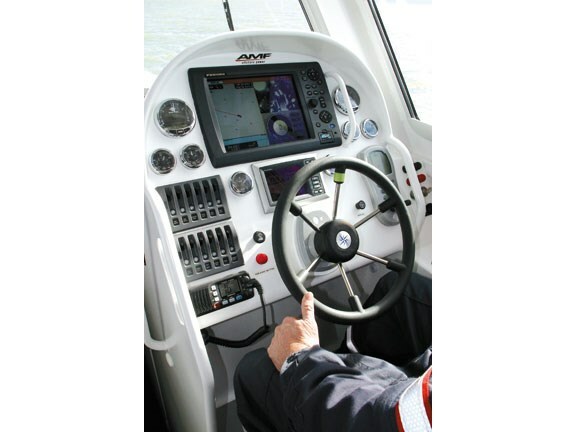 Simply point or shift the mouse in the direction you want the boat to move, and it responds – forward, back, sideways, diagonally. It’s great for slow, close-quarter maneuvring, and ideal for getting close to a distressed boatie in the water. The simple interior layout revolves around three independent stations – the helmsman, the navigator and the communications/radar operator. The helm features an impressive display of electronics, but what catches your eye are the forward-slanting windows. Smith specifically made these part of his design brief. "They offer greater visibility because they’re less likely to collect rain or dew, but perhaps more importantly, they create much more headroom for the helmsman. There is less chance of banging your head in a big sea." 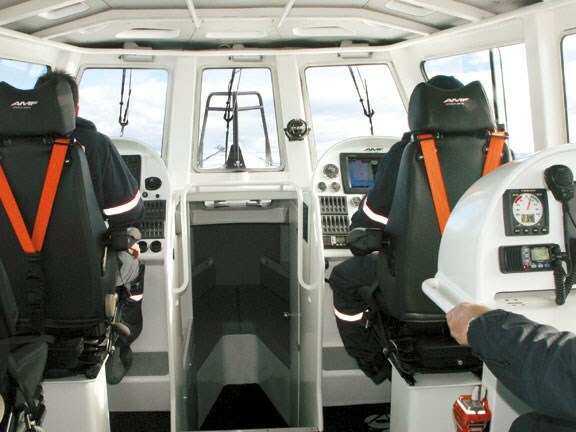 The three identical Furuno NavNet 3D units are all interfaced – so all three crew members are able to keep track of what the others are doing – without continual verbal updates. Smith says the diversity of information presented on the helmsman’s screen is ideal for rescue missions. 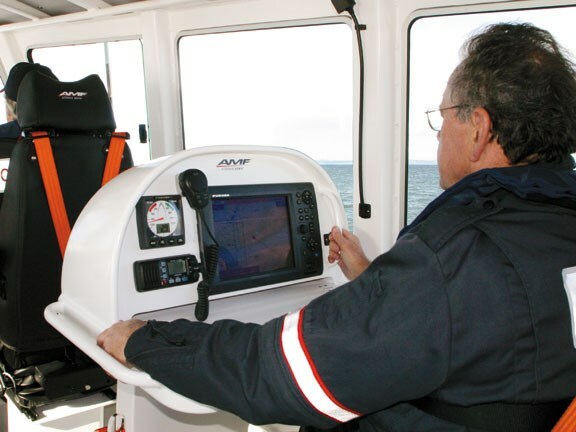 "It can be difficult – on a conventional vessel – trying to keep tabs on a compass, the chart, engine instruments – particularly when you’re bouncing around. With the Furuno screen, all of this information is presented in one place, and it makes your job much easier." AMF’s hull rides the swells smoothly and disperses the water cleanly. It’s supremely comfortable, something the crew will appreciate during gruelling missions, as they will the muted throb from the Cummins diesels. 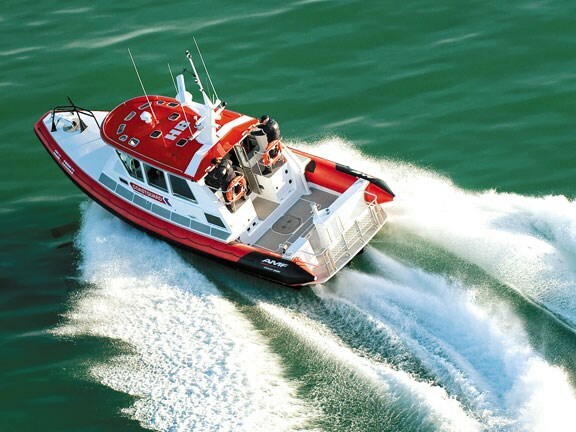 More importantly, those engines offer huge reserves of power, so if (when) the RIB has to get to a scene in hurry, it can. Read the full story in the September issue of Trade A Boat magazine, on sale now.